Dr Zhaolin Chen has received the Douglas Lampard Research Prize and Medal at the Department of Electrical and Computer Systems Engineering of Monash University for his PhD work in Magnetic Resonance Imaging (MRI). 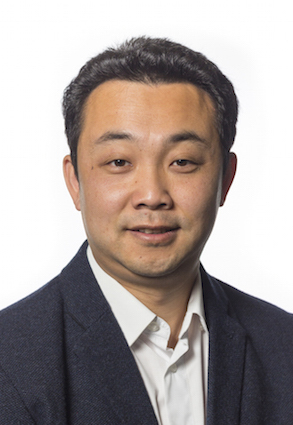 Over his career thus far, Dr Chen has focused on the development of new MRI technology to improve imaging speed, reduce image artefacts, and to enable quantitative imaging. Dr Chen has experience in both industry and academia, which provides him an in-depth understanding of clinical and research use of MRI, and valuable knowledge regarding translating engineering solutions to clinical and research usage in the medical imaging domain. Currently, Dr Chen is the head of imaging analysis team within MBI. The team focuses on developing novel image data acquisition and analysis methods in both MRI and MR-PET. 1. Amanda Ng, Leigh Johnston, Zhaolin Chen, Zang-Hee Cho, Jingxin Zhang, Gary Egan, Spatially dependent filtering for removing phase distortions at the cortical surface, Magnetic Resonance in Medicine, Volume 66, Issue 3, Pages: 784-793, September 2011. 2. Zhaolin Chen, Leigh A Johnston, Dae Hynk Kwon, Se Hong Oh, Zang-Hee Cho, and Gary F Egan. An optimised framework for reconstructing and processing MR phase images, NeuroImage, Vol. 49, pp. 1289-1300, 2010. 3. Zhaolin Chen, Jingxin Zhang, Ran Yang, Peter Kellman, Leigh A Johnston, and Gary F Egan. IIR GRAPPA for Parallel MR Image Reconstruction, Magnetic Resonance in Medicine, Vol 63, pp. 502-509, 2010. 4. Zhaolin Chen, Jingxin Zhang, and Khee K. Pang. Adaptive keyhole methods for dynamic magnetic resonance image reconstruction, Computerized Medical Imaging and Graphics, Vol. 31, pp. 458-468, 2007. 5. Zhaolin Chen, Jingxin Zhang, Ran Yang, Peter Kellman, Leigh A Johnston and Gary F Egan. 2D IIR filter for parallel Magnetic Resonance image reconstruction, the Seventh IEEE International Conference on Control and Automation (ICCA'09), pp. 1792-1795, Christchurch, New Zealand, December 9-11, 2009. 6. Zhaolin Chen, Leigh A Johnston, Nathan Faggian, Mike Kean, Jingxin Zhang and Gary F Egan. A Multistage Parallel Magnetic Resonance Image Reconstruction Method, Digital Image Computing: Techniques and Applications (DICTA 2008), pp. 327-334, Canberra, Australia, December 1-3, 2008. 7. Nathan Faggian, Zhaolin Chen, Leigh A Johnston, Oh Se-Hong, Zang-Hee Cho and Gary F Egan, A method for Shape Analysis and Segmentation in MRI, Digital Image Computing: Techniques and Applications (DICTA 2008), pp. 335-342, Canberra, Australia, December 1-3, 2008. 8. Zhaolin Chen, Jingxin Zhang and Li Chai. Weighted H∞ optimization approach to parallel MR image reconstruction, the 29th Annual International Conference of the IEEE Engineering in Medicine and Biology Society (EMBC'07), pp. 2061-2064, Lyon, France, August 23-26, 2007. 9. Zhaolin Chen, Jingxin Zhang and Li Chai. A Noncausal IIR FB approach to PMR image reconstruction, the 4th IEEE-EMBS International Summer School and Symposium on Medical Devices and Biosensors (ISSS-MDBS'07), pp. 124-127, St Catharine's College, Cambridge, UK August 19-22, 2007. 10. Ke Liu, Zhaolin Chen, Jingxin Zhang. Time Varying Filter Bank Approach to Parallel k-t MRI, the 4th IEEE-EMBS International Summer School and Symposium on Medical Devices and Biosensors (ISSS-MDBS'07), pp. 143-146, St Catharine's College, Cambridge, UK August 19-22, 2007. 11. Zhaolin Chen, Jingxin Zhang, Shenpeng Li, and Li Chai. FB analysis of pMRI and its application to H∞ optimal SENSE reconstruction, the 2007 IEEE International Conference on Image Processing (ICIP'07), San Antonio, Texas, USA, September 16-19, 2007. 12. Zhaolin Chen, Jingxin Zhang, and Li Chai. Parallel MR Image Reconstruction using IIR FB, the 2007 IEEE International Symposium on Biomedical Imaging: From Nano to Macro (ISBI'07), pp. 129-132, Metro Washington, D.C., USA, April 12-15, 2007. 13. Zhaolin Chen, Jingxin Zhang, and Khee K. Pang. Adaptive k-space updating methods for dynamic MRI sequence estimation, the 2005 IEEE Engineering in Medicine and Biology 27th Annual Conference (EMBC'05), pp. 7401-7404, Shanghai, China, September 1-4, 2005. 14. Zhaolin Chen, Jingxin Zhang, and Khee K. Pang. Adaptive keyhole SVD method for dynamic MRI reconstruction, the Eighth International Symposium on Signal Processing and Its Application (ISSPA'05), pp. 211-214, Sydney, Australia, August 28-31, 2005. 1. G. Gilbert, Z. Chen, and L. Laurent, Method and System for susceptibility weighted Magnetic Resonance Imaging. PCT international PCT/EP2016/051908. 2. Z. Chen, et. al, Parallel multi-slice MR imaging with suppression of side band artefacts. PCT international PCT/EP2016/051395. 3. Z. Chen, et. al, Method of generating multi-band RF pulse. PCT international PCT/EP2015/068812. 4. E. de Weerdt and Z. Chen, Parallel MR imaging with Nyquist ghost correction for EPI. International Patent no WO2016026872, Publication date: 25.02.2016. 5. Z. Chen, et. al, Corrected Magnetic Resonance Imaging Using Coil Sensitivies. International Patent no WO2015003950, Publication date: 15.01.2015. 6. Z. Chen, et. al, MR Imaging with Enhanced Susceptibility Contrast. International Patent no WO2014195454. Publication date: 11.12.2014. 8. J. Zhang and Z Chen. Method of Parallel Magnetic Resonance Image Processing, International Patent no. WO2008151380, Publication date: 18.12.2008. ARC Discover Grant #DP110103292, "System identification of microstructure in the brain using magnetic resonance." Leigh A Johnston, Iven M Mareels, Peter M Farrell, Zang Hee Cho, Zhaolin Chen (2011-2013). ARTEMIS JU Grant #269356,"High throughput production of functional 3D images of the brain". Philips Healthcare (2011-2014). Mason Foundation Grant, "Developing a MRI diagnostic technique for Alzheimer's Disease", Zhaolin Chen (2010). Miller Travel Award, Florey Neuroscience Institutes, Zhaolin Chen (2010). Travel and Conference Grant, Ian Potter Foundation, Zhaolin Chen (2009).